Jeremy Maclin, who spent five seasons with the Philadelphia Eagles, retired from the NFL after 8 seasons. Former Eagles wide receiver Jeremy Maclin made his retirement officially official on Thursday evening, posting a lengthy retirement letter to Twitter thanking just about every human being he interacted with during his time in the NFL. It’s a pretty cool move and nice sentiment from a guy basically everyone enjoyed being around. If you don’t, we’ve extracted his lengthy section directed towards former Eagles teammates and the city of Philadelphia. “To the Philadelphia organization and #EaglesNation — where do I start? Jeffrey Lurie, Howie Roseman, Andy Reid, Marty [Mornhinweg], and David Culley, thank you for taking a chance and drafting me. I appreciate the opportunity you guys gave me to play in front of a fan base and city that is second to none. Big Red and Culley, y’all have helped me become the man I am today. Your loyalty and honesty is something that I will cherish for the rest of my life. The memories I have of playing int hat midnight green still give me chills. It isn’t because of the balls I caught or the touchdowns I scored, it’s because of the teammates I got to share the field with every Sunday. I’ll never forget DJac and me talking trash to defensive backs every time we stepped foot on the field. Maclin went on to thank Eagles security man Dom DiSandro “for looking out for me during my time in Philly” and Harold Carmichael “for letting me pick his brain and shedding knowledge about the NFL”. That’s an insane list of name-checks from Maclin, who played for the Eagles from 2009 to 2014. What’s probably more insane is that his former teammate, Jackson, is back with the Eagles this year after working his way through Washington and Tampa Bay. 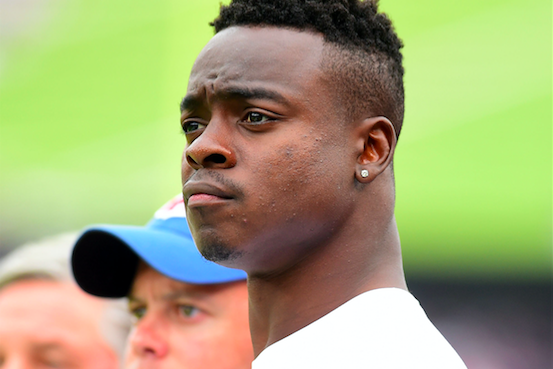 Maclin caught 343 passes for 4,771 yards and 36 touchdowns during his five seasons with the Eagles, including a gaudy 2014 campaign in which he caught 85 passes for 1,318 yards and 10 touchdowns. He signed with the Chiefs in 2015, played two season in Kansas City, and then played the last season of his career with the Ravens in 2017.